In Baroque period there did not exist a guitar like a modern guitar, but we, classical guitarists have many and important baroque repertoire from Baroque music. Of course all of them, but is the "arrangement" .... 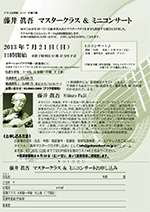 In this concert, I'm going to play Cello Suite No.1 by J.S.Bach on 7-string guitar. Various dances that was popular at that time are included in this suite, but this was an important form of music up to the 20th century. 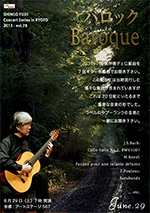 I also play some modern works by Ravel and Poulenc associated with Baroque music. The pages of “Video Library” are now under construction, though you can watch some of the videos already uploaded onto Youtube. Although it is our thought, probably it is feeling, but if they are not told to someone, they are mere "soliloquies." When we speak to someone, "conversation" starts at last. Much conversation is also in music. For example, a quiet conversation exchanged secretly, the conversation which advances simultaneously, or the conversation which asserts a mutual opinion violently and suits. 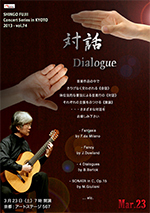 Please listen to many of “Dialogue” in variable pieces for guitar. 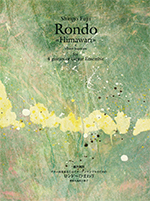 Though the theme is the same one, if a composer is different, a work has another face. 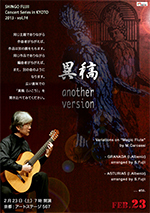 Moreover, though the work is the same one, if an arranger is different, it becomes like another music. 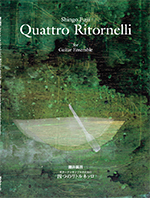 The same theme as "variation Op.9 on Magic Flute" by famous F. Sor was used as an excellent piece, "Mysterious Isis, Op.24 " by M.Carcassi. And I am going to play "Granada" and "Asturias" by I.Albeniz, written for piano solo and well know by arrangment by A.Segovia, by my own arrangements. It is, in a large meaning, the idea of "hearing and comparing" of "different draft". 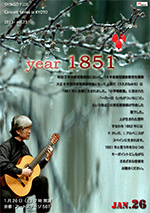 Sanemichi Ue was born in 1851, who is the composer of “January 1st”, and became a musician for Imperial Court Musician. The music "January 1st" was composed and contained in the first "collection of songs for schoolchildren" which the Meiji government edited. 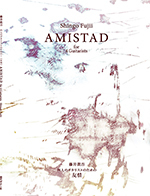 Following years when Mr.Ue was born, musicians, such as F. Tarrega and I.Albeniz, were born in Spain.Please listen to various music, making into one key point the year, 1851.